Mister Rogers changing his shoes, which he did at the start of every episode. Photo courtesy of The Fred Rogers Company. For nearly 50 years, Mister Rogers’ messages of kindness, compassion, and learning have inspired audiences around the world. His television show, “Mister Rogers’ Neighborhood,” made its national debut on Feb. 19, 1968. The show lasted through 2001 and was the longest running series on public TV. Through reruns, Mister Rogers continues to be one of the most beloved characters in television history. Fred McFeely Rogers was born in Latrobe, Pa. on March 20, 1928. As a child he had an interest in puppetry and music and eventually went on to earn a degree in music composition from Rollins College in Winter Park, Fla. in 1951. After three years working for NBC, Rogers left commercial television and accepted a position at Pittsburgh’s WQED, the nation’s first community-owned television station. For the next seven years, Rogers worked as a producer and puppeteer on the local children’s series “The Children’s Corner.” During this time, Rogers also attended the Pittsburgh Theological Seminary and was ordained a Presbyterian Minister. In 1963, Rogers began to create a new children’s show with a colorful cast of puppet characters and a trolley that transported viewers into the world of make-believe. The show was first produced and aired in Canada, then on the Eastern Education Network, and finally, in 1968, a company that eventually merged with PBS began national broadcasts of the series that made Mister Rogers a household name. 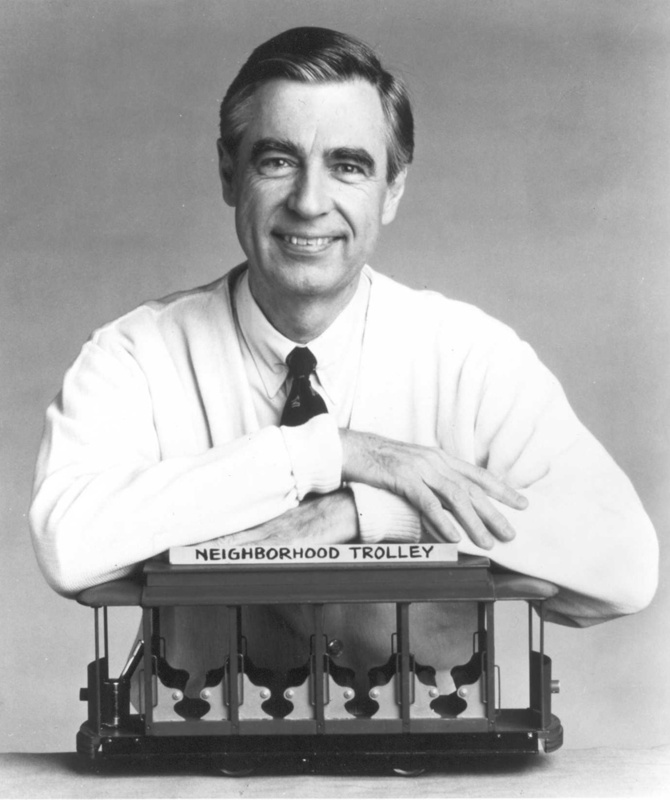 Mister Rogers with the Neighborhood Trolley. Photo courtesy of The Fred Rogers Company. 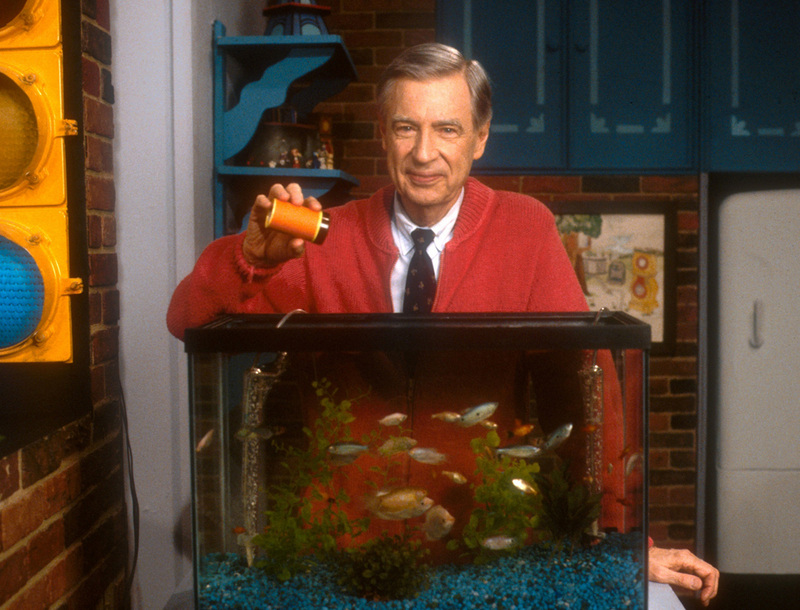 Mister Rogers feeding the fish during "Mister Rogers' Neighborhood." Photo courtesy of The Fred Rogers Company. 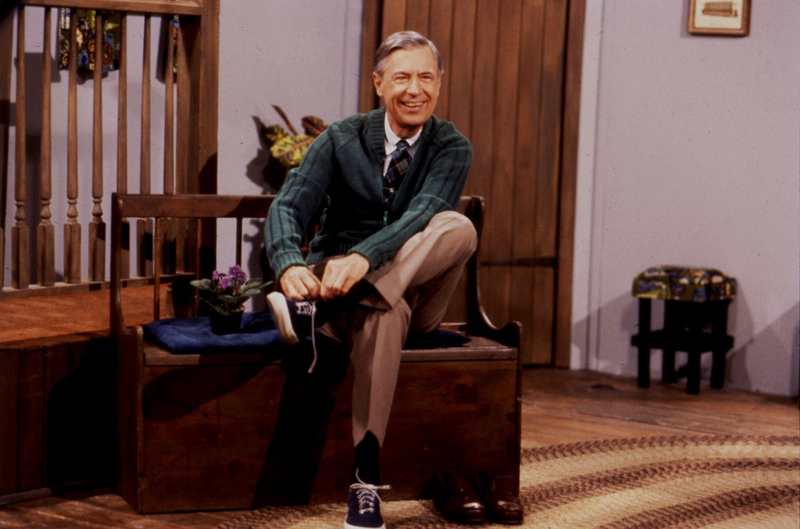 With his signature sweater and tennis shoes, Mister Rogers delighted children and adults with his puppets, gentle ways, and positive outlook on life. But “Mister Rogers’ Neighborhood” is also remembered for tackling subjects traditionally glossed over by children’s shows. In his trademark quiet and simple way, Mister Rogers openly discussed competition, death, divorce, anger, and war with his young viewers. Throughout his career, audiences considered Mister Rogers a “television friend” who could talk honestly about what was important to children. The final episode of the beloved series aired on August 31, 2001. Fred Rogers passed away in 2003 at the age of 74. Visit the original “Mister Rogers’ Neighborhood” set in the Special Collections Gallery on the History Center’s fourth floor. 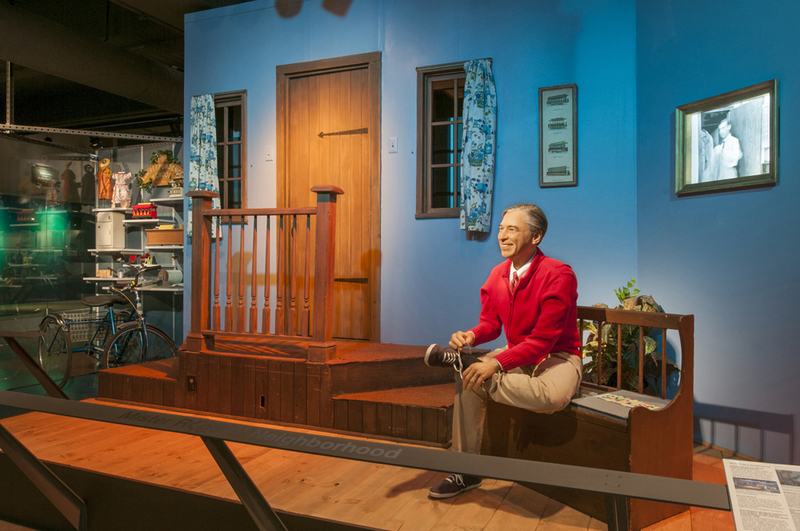 Don’t miss your opportunity to see the original set from “Mister Rogers’ Neighborhood,” on long-term public display for the first time ever, along with several artifacts from the show and a lifelike figure of Mister Rogers as part of the Special Collections Gallery on the History Center’s fourth floor. Lovely! Loved growing up with Mister Rogers. Re-discovering this world an adult is magical and fun.